A new take on personal transportation. An intuitive hands free control system, for freedom of movement and maximum independence! 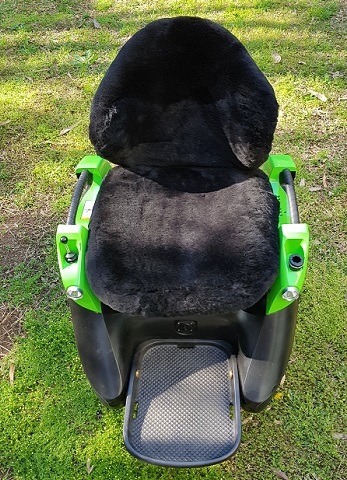 Omeo is the only personal transportation system that fully integrates a unique active moving seat control system with the best of self balancing technology. It is not an add on kit. 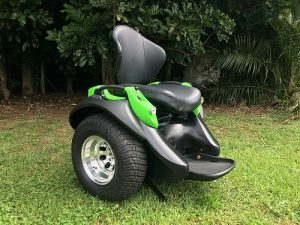 The unique active moving seat control system, not only moves with your body – making it intuitive to use, but allows you to do so…completely hands free! When you are on the Omeo you are using your core or upper body to move, turn and stay in balance – something that has Occupational Therapists very excited. The user is able to move by simply leaning in the direction they want to travel. By changing to the all-terrain wheels, the Omeo becomes an off road monster that can go just about anywhere. 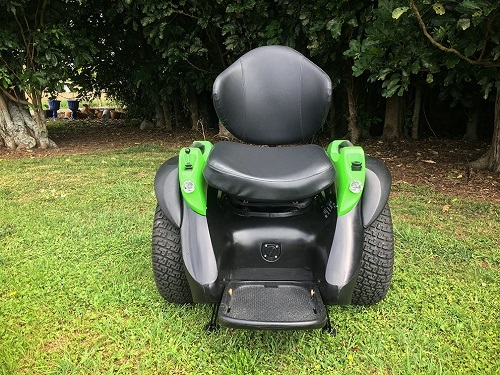 Able to tackle soft sand, gravel, rough terrain and inclines, the Omeo. 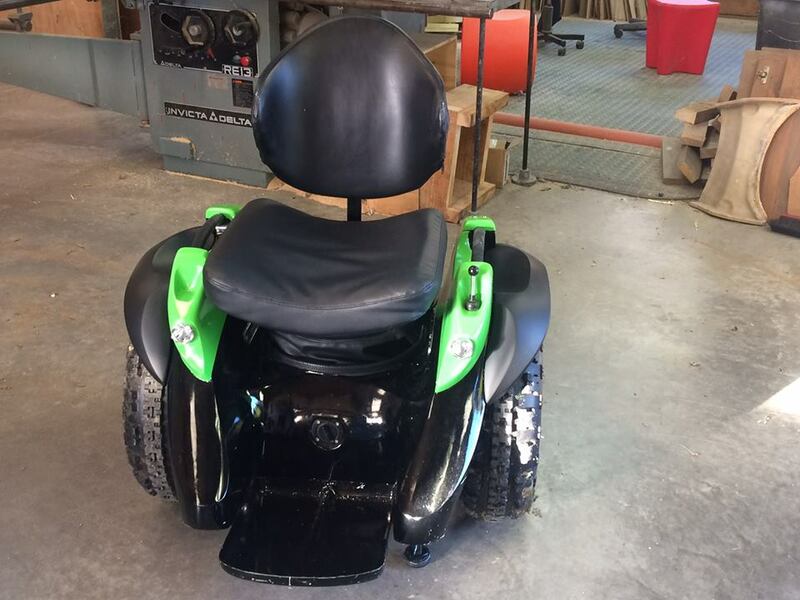 It is the ultimate machine for accessibility and fun! Omeo is designed to be used wherever a pedestrian has access, with some limitations-for example stairs, escalators, extremely rough or slippery terrain. Some countries or jurisdictions have restrictions on where such devices can be used. It is the buyers responsibility to check their jurisdiction’s regulations. The bottom line is freedom, independence and coolness. Optional wide wheels, tyres and mudguards, equipped for Off-road use. Presently Omeo supports weight up to 110kg. Further development continues for the Omeo to suit a wider range of people – including children and those of a heavier build. One of the key attractions is that Omeo will travel up to 20 kph /12 mph. But some countries do have restrictions.It is the buyers responsibility to check their jurisdiction’s regulations and advise us. We will factory set the speed according to your specific jurisdiction requirements. Whilst the Omeo has the best safety and redundancy features of any self balancing device, users will need to be competent using the Omeo before going into public areas (at least 60 minutes practice recommended). We recommend users wear safety helmets and any other protection they consider appropriate. Users should always use the Omeo responsibly, within their competency and always be mindful of the safety of others. For example, to travel at pedestrian pace when among pedestrians. Omeo has in built safety features that will shut it down. For example Omeo will come to a stop if it comes up against a high kerb or obstruction that it is unable to traverse -meaning that it is very unlikely to tip backwards. We do not accept responsibility for users safety if Omeo is used irresponsibly or for anything other than its purpose. What do family members and professionals think of Omeo? Omeo is not just about the users. Family and friends of those who have trialed the Omeo love it too. They have told us that their homes are a happier and healthier environment – that Omeo means more freedom and independence for them and increased opportunities to get back into activities they had given up – walking the bush trails, sports, rediscovering the beaches and parks, shopping. Just participating in life with their partners. “Grabbing life by the wheels”. Caregivers tell us that they are not required to be in constant attendance, there is less strain on their own bodies having to manage manual wheelchairs or hefting heavy powered chairs. Occupational therapists and other professionals love Omeo because it requires upper body movement – exercises core muscles-even if using the joystick. There is less wear and tear on shoulders and arms, assists functionality of internal organs. The increased freedom and independence, also assists mental and spiritual well being often resulting in a more positive outlook which aids recovery or therapy. Travel distance – Up to 40 km / 24.8 miles on a single charge.